It’s a genuine fact that an English teacher should have knowledge of English so s/he can teach students with fluency and in right manner. The teacher should also have a good preparation and organization of the materials s/he is presenting in the very time. The detail knowledge on subject matter is very crucial. The vocabulary power assists the teacher to be strong in their lecture or class. The continuous speed up or steady teaching cannot be effective, hence sense of humour play a role for this purpose of holding the class within the control of teacher. Perception of an individual differs according to the attitude of a person. Good attitude can be also an important factor for determining the perfection of teachers. Good attitude leads to positive response from the listeners. The environment is a dynamic factor; therefore teacher should be able to cope within given educational environment whether it suits his/her personality or not. They must pave a way to develop congenial environment where they are teaching. In fact, the expectations I put on were fulfilled when I was at graduation level. On remembering my English teacher, today also I felt so warm about her and her teaching. Writing about her teaching is like describing the natural beauty that adds value to the environment. Really I am privileged by this chance on putting words about the personality whom I admire. The smiling face, so poised and elegant nature adds her personality. Her speaking was pellucid; her soft and sweet voice, attracting the attention of whole class; the class which used to be noisy in other’s lecture. Her presence makes the class dear and lovely. Her vocabulary was fabulous and power to make whole class understood is admirable. She had full knowledge on subject matter she was talking on. She was conscious about her words and used to alert timely so students’ attention can be gained. Her encouragement on better writing and good speaking made us careful on our doing. She used to delineate on how to impress the reader by the simple and meaningful writing. I still remember the fact she said – use of difficult or unfamiliar words do not add to clarity and impressiveness of writing; rather writing should be clear, precise and trustworthy to draw the attention of the reader. Her role was remarkable in my life time. She encouraged me in learning English to the extent I need. She used to dictate each and every ideas and information on the topic. She never felt bored and irritated by my questions. In return, her answers used to be reasonable to the questions asked. Today whatever I am able to write freely is the result of her teaching and her inspiration. As an English teacher it is false to view that a teacher should memorize the whole dictionary or the whole concepts on English but he/she should be an expert in the subject matter, in classroom management and in teaching techniques. This is such a delightful article to read on this English Language Teaching blogzine. First, it gives us a student’s perspective about a good English language teacher. Of course, this provides us one student’s personal perspective, so we shouldn’t generalize these qualities as universally applicable. When I read it, I was thinking, for instance, that some students may not care so much about “body language” or they may assume “vocabulary knowledge” as a given rather than a quality of good teachers. Second, I like how Manju uses the example of her own teacher to explain, although, again, some of the writer’s “criteria” could be a little unrealistic. For example, I was a little “scared” to think that I may not be so “sweet” with my students (not only because people with less sweet personalities can still be good teachers but also because they or their culture may not see that as the most desirable quality in an effective teacher.) Finally, Maju states at the end that teachers cannot be perfect but they must be their best, suggesting that students will like us if we do our best. What a wonderful piece of writing–one great view of a good English teacher from a student’s perspective! i accept that it is really a helpful article that makes any English teacher to think about herself/himself on how s/he is presenting in the classroom. As far my experience says that the students want those teachers who behave very friendly and try to make the course easy to understand by providing lots of example from their real life experiences rather giving lecture the whole period. thank u so much for ur response. First of all, I would like to congratulate Manju for producing such a nice essay about her teacher. As I also taught you but the “qualities of an English teacher” that you mentioned might not have to all teachers, still the teacher, as you mentioned in your essay, should have good command over the language and content that s/he is imparting to the students should match to the need and language level of the students. Being a student of business world, you composed a really nice essay. In the mean time, as you talked about proper body language, I am afraid that most of us, as teachers, do not consider the posture of the body at the time to teaching, which as you suggested, we need to consider in the days to come as well. I am very proud of you, Manju and hope to read similar types of essays in the days to come as well. 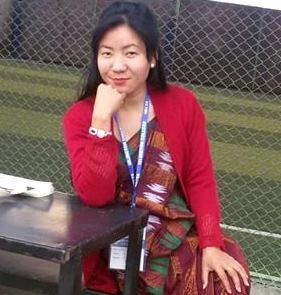 Best of luck ahead and very very delighted to read your essay about an English teacher in blogzine of English teachers. I wish I had someone could write the reflections on the ways I teach in the classroom. After going through the short and sweet piece of Manju’s writing, I think almost all the teachers (maybe the editor of this issue Bal Krishna Sir and even Shyam Sir who first made the comment) wished the same as I do. Of course, the reflection is what we all those who teach in the classrooms need. It provides an opportunity to see our teaching. If the same is shared through some publication either through journal or blogging (as it has been posted on the blog), it helps us know what a student expects from the teachers. Such a reflection can be used for exploring strength and weak points of the teachers. What I opine is the characteristics defined by Manju jee in her writing cannot be applicable to the characteristics of all the good teachers since the teaching is affected by the need of the students and the context they have been studying at. The teaching in the US varies in Nepal. Even in Nepal, the good teaching defined by the students of Kathmandu will be quite different from that of Birgunj or elsewhere in Terai. However, this is an interesting as well as important piece of writing for teachers. Since reflection is one of the strategies of professional development for teachers, it can develop self-awareness and self-consciousness on the part of the teachers and gradually they can improve themselves and help others improve. Therefore, we want more students or student teachers write the reflections and share on the blogs so that we can be able to change ourselves accordingly at desired level.